Albany second baseman Rayanne Ridgell (11) makes a play to first base in Tuesday's Class 3A playoff game at Erath. Albany's Heather Degenhardt (12) tries to get back to first base ahead of the tag of Erath's second baseman in Tuesday's Class 3A regional playoff game. 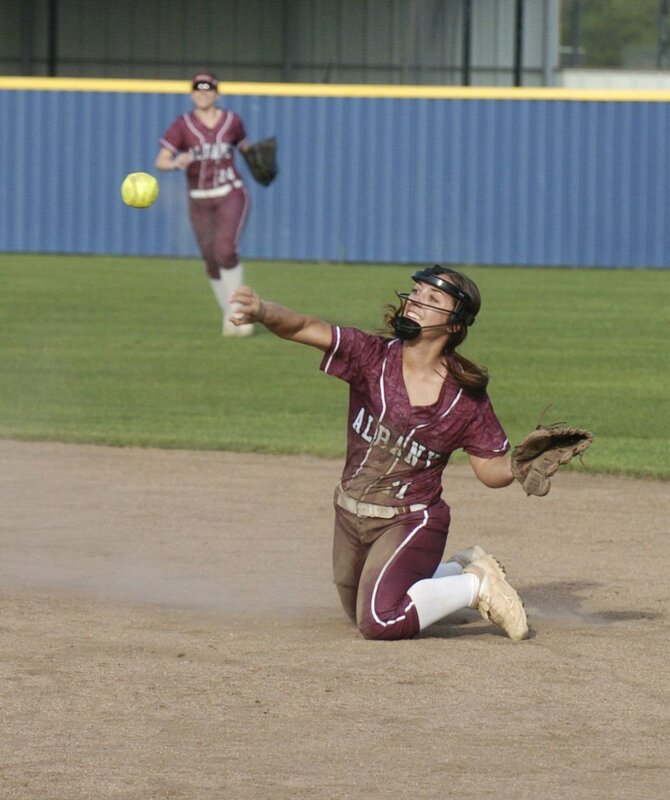 A swing of the bat in the bottom half of an inning did Albany in for a second straight year when Erath sophomore Courtney Dubois slapped a walk-off single past shortstop in the ninth inning for a hard-earned 1-0 Class 3A regional victory. A swing of the bat in a bases-loaded scenario in the seventh inning turned nightmarish for Albany in a game-ending triple play last season. Knight dealt with yet another blow when he spoke to his players Tuesday after their season ended at 22-10. After 8 ½ scoreless innings, Erath’s Aubrey Desormeaux legged out a one-out single up the middle, barely beating a throw by second baseman Rayanne Ridgel, who hustled to her left to get to the ball behind the bag. That opened the door for Erath (20-9), but Albany junior pitcher Brittney Turner got a key strikeout, her 10th of the game. Following a fielder’s choice in which both baserunners were safe, they then executed a double steal to leave Lady Bobcats at second and third and bring up Dubois. Dubois, hitless and a strikeout victim in the second inning, worked the count to 2-2, fouled off several offerings from Turner, then stroked the game-winning hit. Turner, who went the distance, said the pitch was a curveball that, along with a screwball and changeup, carried her through the tense innings. She said she wasn’t tired. “I’m usually pretty consistent in a long game. She (Dubois) had fouled off I don’t know how many,” she said. It was a hard way to lose, she said. Knight wondered what happened to his team’s offense. The Lady Hornets had been raking the ball and scoring runs in bunches for the last six games, including a 12-0 first-round state playoff romp past Eunice. Against Erath’s Lexie Gisclair, however, Albany was hard-pressed to amass five hits, two of them by third baseman Maddie Oubre. Gisclair wasn’t a flamethrower but got the job done, Knight said. “We had 17 hits last week. Our first six girls went 15-for-18. Look, we have practiced and practiced hitting slow(er) pitching. We just can’t do it,” Knight said. The game went to extra innings after an inning-ending play in the bottom of the seventh inning foiled the Lady Bobcats. With two away and a pinch-runner in scoring position at second, Erath catcher Rylee Vincent dropped a well-placed bunt that was fielded and thrown to first. Vincent apparently was out but the infield umpire ruled the first baseman was off the bag. Knight argued the call with both umpires, successfully noting that Ridgel, the second baseman, actually took the peg in front of AHS first baseman Annalea Giamalva. Albany stranded six baserunners and had two players thrown out at the plate, one in the first inning and another in the fifth inning.